Expanding your manufacturing company into Mexico is one of the best business decision that you can make. As a major manufacturing center, Mexico has numerous free trade agreements that include 44 countries. This means our clients have duty-free access to 60% of the world GDP. As the fourth-largest auto exporter, second-largest U.S. auto parts exporters, and fifth-largest automotive parts exporter in the world, Mexico is a globally competitive market that offers plenty of valuable opportunities for companies who are eager to take advantage of world-class infrastructure, a cost-effective business environment, strategic location, a well-trained and educated labor force, and regulations that encourage business growth. If you are ready to reap the benefits of nearshoring manufacturing in Mexico, let El Grande handle the complexities of the expansion for you. Logistics is much more than moving freight. El Grande Group understands this and our team of manufacturing and international business experts are ready to provide you high-quality assistance to guide you through the Import-Export, Procurement, and Logistics processes so that you can efficiently move your product to anywhere in the world. Determining the correct Harmonized Tariff Codes for parts and final products. Analyzing the most efficient, economical routing for parts and finished product, contributing to bottom line profitability. Evaluating your company’s eligibility to benefit financially from all of Mexico’s trade agreements including USMCA and IMMEX. Ensuring compliance with all regulations and Rule 8 to prevent unnecessary payment of duties as well as reduce the risk of penalties for non-compliance and errors. Ensuring access to reliable cost-effective transportation providers for supplies and finished products for over-the-road, sea, rail, and air shipments. Economy-of-scale freight and consolidation of shipments (when possible) to lower shipping costs. Start benefiting from the new P.I.T.A system today! Take advantage of this new system and maximize import/export efficiency and cost-effectiveness. El Grande Group can help. Contact us today at 1.646.300.9401 for more information! Mexico customs processes are becoming modernized to improve the efficiency of importing and exporting goods. The Customs Technological Integration Project – known as PITA – is one such initiative that will streamline customs processes. This project will automate and facilitate 60 points of inspection for the clearance of freight goods passing through Mexican borders as well as maritime and inland customs. This automation will help to reduce customs clearance times, improve business intelligence, and increase the security of all goods exchanged within Mexican customs. Mexico’s national importers and exporters association, ANIERM, has stated that PITA could reduce the time merchandise sits in customs by 30 to 50 percent. This project is being implemented in the 49 custom ports of the country. El Grande Group offers strategic border-crossing options and cross-dock facilities at the Reynosa-Pharr International Bridge to ensure waiting times for shipments are significantly reduced in comparison to traditional lanes. The Pharr bridge is the sixth largest land port of entry in the United States, the fourth largest on the U.S.-Mexico border, and is currently undergoing an $80 million renovation on the Mexican side. This new expansion includes ten lanes with several dedicated specifically for commercial trucks. Alongside this Mexican project, $30 million will also be invested in the U.S. side by 2020 to improve the Pharr port of entry. These improvements include a BSIF gate-to-gate connector, two additional entry lanes and booths, two additional exit lanes and booths, dock expansion, additional cold storage inspection facilities, and an agricultural training center and laboratory. This growth will help to increase crossing capacity, eliminate unnecessary procedures for truck drivers, reduce border wait time, streamline the inspection process, and improve commercial truck throughput and trade. 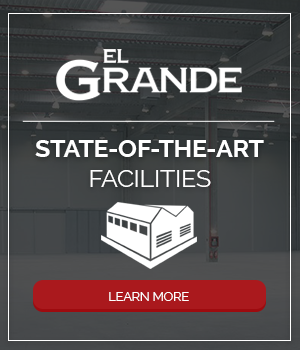 El Grande Group is dedicated to delivering unmatched cross-docking and logistic services for our clients. Our goal is simply to ensure you benefit from efficient exportation and importation processes, economies of scale logistics, and competitive shipping rates.